Well we have the fourth largest military in the world. We are also the fifth largest spender on defence. I've been looking for the best stocks in this sector for the last few months. I'm happy to report that I've shortlisted 3 stocks I believe will benefit the most from this boom. PS: Tanushree Banerjee, editor of StockSelect, has uncovered the 3 stocks that are best placed to ride the boom in India's defense industry. She is ready to reveal the names very soon! Equitymaster requests your view! Post a comment on "Get Ready to Make Big Profits in India's Defense Sector". Click here! 2 Responses to "Get Ready to Make Big Profits in India's Defense Sector"
What matters is how much of the defence budget is actually spent on Capital expenditure vis a vis revenue expenditure. Again in Capital expenditure, how much of the orders are given to Indian companies (which I believe is miniscule in comparison to the orders given to foreign companies). Further orders given to Indian private sector companies is still less, despite their capacity and timely execution, vis-a-vis public sector enterprises. For strong defence, faster and bigger order allocation to private sector companies becomes an urgent necessity. 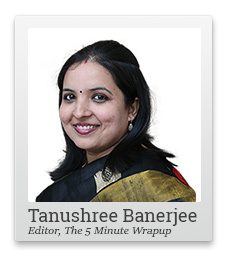 I have been an avid reader of the 5 minute wrap-up. Incidentally, "5-minute" not '5 minute ' would be correct. After retiring as News Editor from the Indian Express more than twenty years ago, as a freelance copyeditor I have edited more than 60 books on different subjects, besides more than 15 Ph.D. theses. As you must have guessed , my focus is on the correctness of language. In today's " Wrap-up" there are two mistakes. 1. Seventh line above "The only stock to score" box, It should be "India is on the way to becoming (not 'being'). The third line, " issues related to..... Is commonly in the news". It should be " are" commonly in the news. Hope you will take this feedback in the right spirit.